It is generally agreed by independent observers that the 2018 parliamentary elections in Bangladesh were flawed. The ruling party won more than five out of six seats in parliament while the opposition was nowhere to be seen during the campaign or during the vote itself. Transparency International found serious irregularities in 47 of the 50 constituencies it investigated. Most of the manipulation had been orchestrated during the weeks and months before the election, including the arrest of opposition activists on criminal charges and the refusal to accept nominations on the ground of loan defaults. These decisions were within the bounds of the law, but the law was clearly applied with a political bias. In the end, the election result was not a surprise. What is surprising is that a not dissimilar manipulation of electoral laws in 2006 engaged domestic forces and foreign powers to enthusiastically support what was in reality a military coup (known as a ‘caretaker government’), a clear contrast to the reactions now. With the 2006 experience in mind, we ask why the controversial and flawed elections of 2018 have been accepted by Bangladesh’s key foreign partners – including the liberal democracies of the West. Our analysis builds on the fact that the election took place in a time when the geopolitical power dynamics are rapidly shifting east. Foreign pressure for democracy and a fair vote has diminished to the extent that internal democratic forces find themselves without external allies. The influence of the democratic West has weakened while the populist autocratic India and the increasingly self-centered and autocratic China have emerged as key power brokers. The global contest between the US and China has also taken attention away from the state of democracy in Bangladesh. To its key external partners, stability is at the moment more significant than a flawed election because an unstable Bangladesh would have multiple repercussions for the region. In the national election held on 30 December 2018, the ruling Awami League (AL) won a landslide victory. 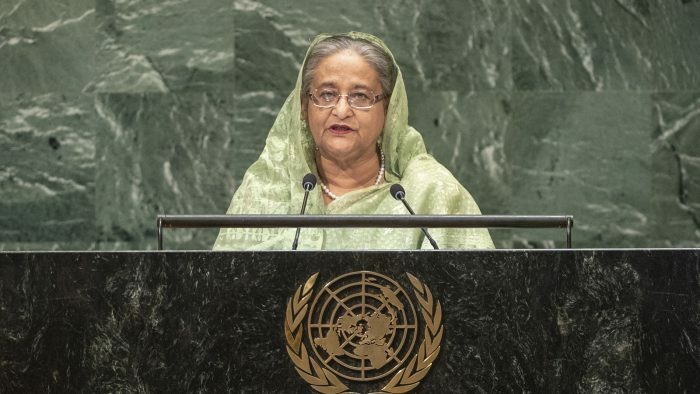 With 288 out of 300 seats in parliament, the AL-led grand alliance has formed a government under Prime Minister Sheikh Hasina for the third consecutive term. The main opposition was AL’s archrival, Bangladesh Nationalist Party (BNP), that along with a few other smaller parties ran under the banner of Oikyofront (United Front). In addition, there were a handful of religious parties and leftists running. All these have rejected the result and have demanded a fresh election under a neutral caretaker government. They alleged that AL had used state agencies to manipulate the election result. Oikyofront and its constituent parties have decided not to join the parliament (even if one or two MP-elects may choose to ignore that decision). International organisations such as Human Rights Watch and Transparency International Bangladesh (TIB) have pointed to numerous instances of irregularities, including the partisan nature of the Election Commission, overnight stuffing of ballot boxes with the help of state officials, voter intimidation, and the imprisonment of political opponents. The government is perfectly secure and has dismissed these allegations. A minister even called TIB a BNP-affiliated thinktank. In reality, a new election is highly unlikely and the opposition is in shambles. The BNP Chairman Khaleda Zia is imprisoned on the corruption charge. Her son and heir has recently been sentenced to life imprisonment in a high-profile political assassination case though he has been living in exile in London for the last 12 years. Hasina’s other enemy, the Islamist Jamaat Islami, is near extinction. Several of its top leaders were hanged or imprisoned for life on charges of crime against humanity during Bangladesh’s war of independence in 1971. Others have fled and lived in exile in the West. Hundreds of activists are imprisoned and many were killed in ‘encounters’. The government is in a solid position to rule another full term with virtually no active opposition. Because Oikyofront leaders are boycotting the parliament, Hasina has set up her former ally, Jatiyo Party, as the formal opposition party. Reactions to the election from Bangladesh’s key foreign partners have varied, but no one has seriously protested. This in contrast to the situation in 2006. The then BNP regime openly manipulated electoral law in an effort to ensure its continued rule, and it used police forces and its own activists to prevent mounting street protests by AL and others. The manipulation and the violence reportedly prompted Western powers, the UN in Bangladesh, and Indian officials to make their objections known, and they did this sufficiently well to encourage to nudge or push Bangladeshi forces into action and to support a civilian coup – formally a prolongation of the caretaker government system. This non-elected civilian government enjoyed the support of the armed forces, the bureaucracy, and largely also the judiciary. It was also supported by Western powers, the UN, and India. It was sufficiently worn to be discarded after two years, but only after organising what is generally agreed to have been a free and fair election. Awami League under the leadership of Sheikh Hasina won a clear victory. She, however, made use of her parliamentary majority to do away with the then-controversial caretaker government provision. This again prompted BNP and its ally Jamaat Islami Bangladesh to boycott the 2014 election. The boycott only ensured an even larger majority for AL, with 150 MPs elected uncontested. Again, few if any Western country called for a new election in 2014. At the time, however, the opposition had engaged in a long-drawn and violent campaign with indiscriminate petrolbomb attacks on public properties and private citizens, and so no democratically inclined foreign government could insist on a new vote. The opposition might have benefitted from a re-election but had by that time tainted itself too much with its violent street agitation. And so things were left as they were. Gradually AL successfully established itself as the country’s leading political force with firm support from the bureaucracy, the judiciary, and the armed forces. It was from this position of unrivalled strength that it could stage-manage the election of 2018 so well. There was no state force left to oppose it; on the contrary, most seem quite happy with the outcome. Among foreign powers, China, India and the Middle Eastern monarchies were quick to endorse Hasina’s recent win. The response from key Western powers such as the US, the UK and the EU were careful but not hostile. They promised to work with the new government while in a muffled voice said it was important to address the issue of alleged election irregularities and the human rights violations. The lack of strong protests from foreign powers can only be explained by the fact that Bangladesh is now situated in a rapidly evolving geopolitical landscape. Bangladesh is not a major player in the international scene of geopolitics – however large in terms of population (comparable to half of South America). It is lodged among giant nation-states and trade blocs and tucked away in a corner at considerable distance from important shipping routes. And yet it has some importance, particularly in the context of growing competitions among China and other powers. Its growing economy represents both a market and a production hub, and it has attractive gas reserves in the Bay of Bengal. China is already investing heavily in manufacturing, roads, ports, and power plants, and has overtaken India as its largest trading partner. While trade between India and Bangladesh is expected to reach 10 billion dollars in 2018, the trade between China and Bangladesh is estimated to reach 30 billion dollars before the end of 2021. China’s interest should not be overestimated, though. China’s investments in Bangladesh are huge, but they are on loaned money and the relationship between Hasina’s regime and Beijing is a far cry from what Sri Lankan premier Rajapaksha entertained. Bangladesh’ proximity to India makes it interesting to Beijing albeit not as interesting as the more strategically located Sri Lanka. For India, Bangladesh is more important and is crucial in its eastern policy. Access to the seven states in the northeast is either through the ‘chicken neck’ corridor just north of Bangladesh or through Bangladeshi territory. Overland transit and transit through the Chittagong harbour are major benefits India has gained from its warm relation with the current regime. An end to cross-border terrorism and secessionist movements is another, while illegal migration and smuggling are within acceptable bounds. Delhi would scantly want an enemy regime in Dhaka and is currently fine with Dhaka’s careful exploitation of Chinese offerings. An interesting development is the increased military collaboration between India and Bangladesh in training programmes and joint exercises. There is also an expanded naval collaboration with coordinated patrols. These initiatives have helped create a common outlook and a shift among the Bangladesh armed forces from a focus on the border between the two countries to a more regional focus on collaboration and mutual support. The influx of Rohingya refugees from Myanmar that much vexed the Bangladeshi establishment helped reorient the armed forces’ focus from protection of the national territory to regional stability. To the US, Bangladesh with its position in the Bay of Bengal region has increased geostrategic significance to its effort to contain Chinese influence in the Indo-pacific region. After the election, news reports state that the US recently offered to sell arms to Sheikh Hasina’s government. This is possibly a bid to unsettle the dominance that China enjoys with its 80 percent share of Bangladesh’s arms import. Moreover, Bangladesh is an important ally in the fight against terrorism. Besides, at a time of a rising China investing huge sums in bridges, ports and factories in Bangladesh, disengagement is not a viable or prudent option. Chinese investment in Bangladesh also raised alarms in India so much that before the election an advisor to Prime Minister Sheikh Hasina had to explain to New Delhi that there is nothing to worry about. Dhaka’s stance is that China is merely Bangladesh’s development partner. However, alongside weapons, Bangladesh has also bought submarines from China and it has joined the Chinese One Belt One Road initiative. To Dhaka, the strategy is clear. They balance Indian influence with Chinese offerings. Western powers individually and through their importance in the UN agencies and the World Bank used to play a pivotal role in Bangladesh, funding both its crucial development budget and its huge number of non-governmental organisations. This situation has changed. India and China are now major trading partners, and development funds come from the Asian-dominated Asian Infrastructure Investment Bank or as loans from India or China. The shift in geopolitical power that is happening with the rise of the East also contain a separate if interdependent developments: China and India are not only economic giants, they also both tend towards authoritarianism or populist authoritarianism. These political tendencies will prefer neighbouring countries to be stable rather than democratic. The ideological foundation of Western influence has been weakened. The relatively weaker position of the West is clearly indicated in the mumbling protestations that were made by the US and the EU against the election. They were not happy, but loud objections would have committed them to a course of action they did not have the tools for. The West cannot push a democratic agenda in faraway places quite the way it used to. To Bangladesh’ new set of external partners, democracy is not a priority. Stability is. An unstable Bangladesh would have multiple implications for regional and global politics. In 1971, India hosted as many as 10 million refugees when the population of Bangladesh was only 70 million. Now with population is over 160 million, an unstable Bangladesh would pose a threat well beyond India. Even if a stable Bangladesh remains highly unequal and Bangladeshis in record numbers are trying to enter Europe, US, and South East Asia illegally, a stable and strong government would help contain these numbers. Then, of course, there are the global jihadists, some of whom have called for Bangladeshis to start a war on its own government and others who have organised for a fight against Myanmar. There are also concerns that the sheer number of Rohingya refugees in Bangladeshi may strengthen recruitment to global jihadism or at least strengthen the Rohingya insurgents, reported to have sympathisers in the Bangladesh refugee camps. Realising Bangladesh’s significance to stability, The AL government has made the most of its bargaining power. To the country’s external partners, Hasina presented herself as the best choice to safeguard their interests and successfully sold the idea that the BNP in power would make the country unstable. So what does it mean for the future of democracy in Bangladesh? One probable scenario is that AL will remain in power for long enough to diffuse and exhaust its opposition. Human rights, freedom of speech, and political equality are likely to remain under pressure even while the West is likely to continue its support for dissents and critics. However, Sheikh Hasina is also growing old. She is now 71 and the undisputed ‘strongman’ leader of her party. It is not clear who will be able to replace her when that time comes. The party has a history of internal rifts. With a weakened opposition, signs of internal conflicts are increasingly visible. Dr. Arild Engelsen Ruud is a Professor of South Asia Studies, University of Oslo, Norway. He is also the Head of Research at the Department of Culture Studies and Oriental Languages at the Univeristy of Oslo. His latest co-authored book Mafia Raj: Rule of Bosses in South Asia was published by the Stanford University Press in 2018.